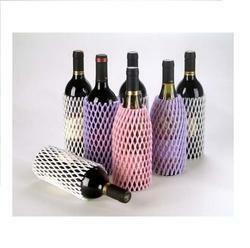 Offering you a complete choice of products which include protective sleeve, packaging net, packaging mesh, wine bottle sleeve, cylinder packaging sleeves and foam net. Size 15mm to 180 mm diameter. Pelican Poly is engaged in offering Protective sleeves made of specially engineered thermoplastic designed to give protection to components during manufacture, storage, transit and shop floor handling. 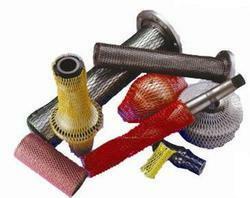 They are used in protecting a large variety of tools and components like shafts, gears, pistons, precision bolts, threaded components, tubes, glass bottles, etc. These polymer sleeves are tough and flexible and offer superior performances. The sleeves are flexible and cling to any odd shaped surfaces and contours of the product. Being soft, they act as a cushion, thus ensuring complete protection. Pelican Poly delivers reliable and cost effective solutions in packaging for products which need to be displayed or require ventilation. 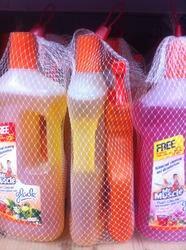 A wide range of packaging nets are available readily and we can develop one specially for your as well. Some standard products are given below. 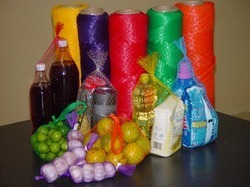 Fruit bags are a convenient and easy way of packing fruits, vegetables, mineral water bottles, toys, etc. Our expertise lies in offering quality finished and durable Packaging Mesh that are highly suitable for providing packing cover support to fruits, liquor bottles, gift articles, vegetables, toys and other similar products. Finding wide usage in packaging sector, these durable quality mesh provide optimum protection to goods while in transit and storage as well as its open mesh finish also allows better visibility to the product. The latest technology support available at our end allows us to develop these packaging meshes in specific construction choices as preferred by the customers including in different mesh patterns, material weight, color options and other style options. The exceptional quality based Wine Bottle Sleeves are made available by us in multiple color choices with width options of 65mm and length of 210mm and others as specified by the customers. Providing for ideal support for safeguarding bottles from dust and stains, these sleeves can also be re-used and help in maintaining bottles and its labels in new condition. Providing for long lasting usage, we can also custom develop these bottle sleeves in choices as preferred by the customers. We are a noted organization engaged in offering clients superior Cylinder Packaging Sleeves. High-end manufacturing machines and equipment are used in fabricating these sleeves. Having close grainesd structure, these products exhibit excellent working. Moreover, our professionals make use of quality tested for manufacturing these products. Foam Net options offered by us are available in different sizes and perfectly suit the needs of providing attractive packaging cover support to products like liquor bottles, gift articles, fruits, vegetables, toys. The use of these nets is also preferred as it provides for suitable protection as well as decorative support to fruits, bottles where the overall finish is more eye-catchy and neat. With our expertise in providing end solutions in different sizes color choices, these nets are also suitable for protecting of fragile glass items from possible breakage during transportation and storage.